This post may contain some affiliate links. A purchase from these links may result in compensation which helps keep this blog running so I can continue to produce content for you. Being an educator and having a birth through five early education degree, I have an obsession with play rooms and play spaces. Play is so important for a child’s development. I wanted to pull a guide together so you can easily pull a room or space together. It’s always a fun surprise as a birthday or holiday gift. The Wander and Roam mat shown below in gray and white is great for all ages. It has a soft and foamy feel. Big win, it’s free of latex, BPA, PVC, & formaldehyde. It’a also nonflammable, hypoallergenic, durable, waterproof, and super easy to clean. I feel like each home needs one, no matter the age of your young child and especially if you have hardwood or tile floors. Lorena Canals rugs are amazing because you can put them in the washing machine and dryer! No more fear of spit up or spills! They are also always coming out with so many fun designs! I’m so in love with our dress up furniture! Izzy easily takes her dress up clothes on and off this piece of furniture and no, it doesn’t usually look this tidy. Izzy loves playing and “cooking” in her kitchen. 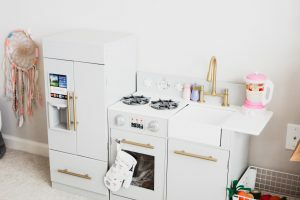 Find the perfect kitchen for your little(s). 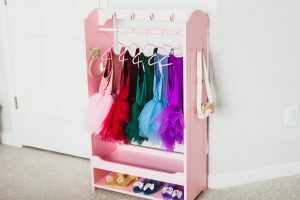 I love your little dress up rack! We need something like that. I LOVE these ideas!! Those rug options are amazing! I love the costume storage!! Love the shelves and little closet!